These four workplaces have got work/life balance down pat. Prepare yourself for some serious office envy. For more than eight million Australians, one-third of their life is spent at work. 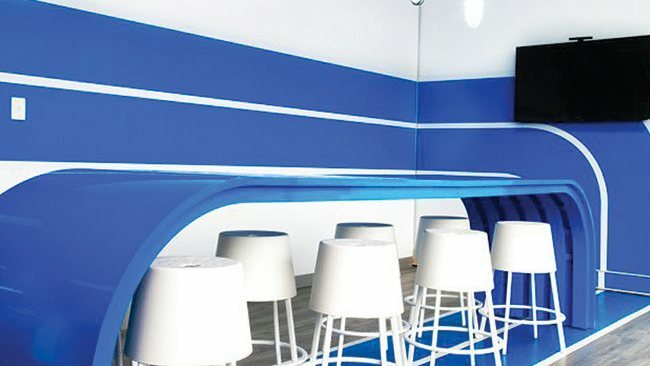 With obesity rates climbing faster in this country than anywhere else in the world, plus chronic diseases such as type-2 diabetes and mental health issues such as depression on the rise, it’s well and truly time that workplaces take proactive steps to improve the health of their employees. The benefits are numerous. As well as having happier, healthier employees, businesses also see significantly reduced absenteeism and improved productivity levels. Research by health fund Medibank Private found that, on average, an unhealthy employee takes up to 18 days off a year; a healthy employee takes only two. And earlier this year, a study by Pricewaterhouse Coopers found that for every dollar companies spent on their employees’ mental health, they could expect a return of $2.30. These four companies of varying sizes and budgets are leading the way with work wellness programs. The internet company has more than 800 staff at its head office in Sydney. Free breakfast, lunch and dinner in the cafeteria (with meals coded according to nutritional content), plus healthy snacks and fruit. Free exercise classes, yoga and Pilates, plus massage and physiotherapy. 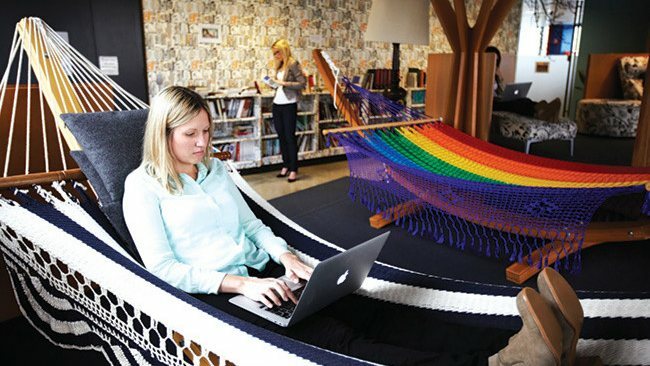 Relaxation rooms with sleep pods, casual work areas with hammocks (pictured, above) and standing desk areas. Free seminars on topics such as quitting smoking, improving motivation and boosting financial skills. Free skin checks, diet consultation and flu shots. Scooters to travel between offices (pictured, above). Create a relaxation area in your office with some leafy plants, a comfy chair and magazines. 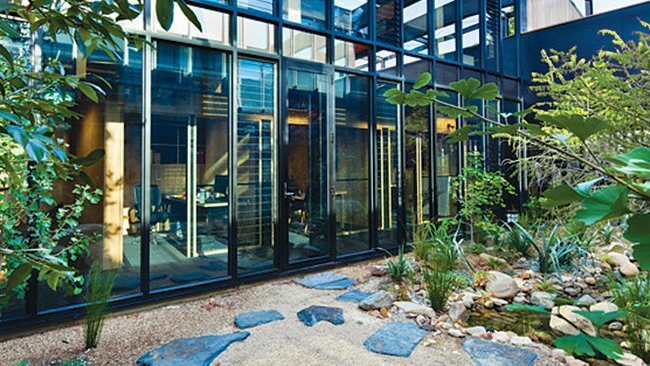 The manufacturer of vitamins, supplements and skincare products has 150 staff at its Sydney and Melbourne offices. Free breakfast for early starters, plus deliveries of fresh fruit. A naturopath and dietitian who map out plans for employees to maximize health and well-being. One day off a month (called a “health and happiness” day) for all full-time staff, in months without a public holiday and in addition to their annual leave. $1000 of products from the Swisse vitamins, skincare and sports nutrition ranges. Incentives to recognize and reward staff, such as tickets for major sponsorship events. Don’t have fresh food deliveries? Team up with colleagues to create your own weekly fruit basket. The retail group has 1000 staff at its head office in Victoria. Bring your dog to work days. 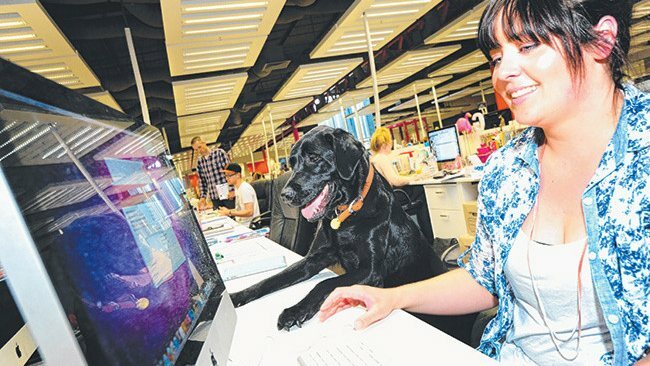 Not allowed animals in the office? Arrange a bring your dog to lunch day at a nearby park. The fitness industry association has 23 staff nationally, with main offices in Melbourne and Sydney. Annual consultation with dietitian and cooking demos. Weekly delivery of fresh fruit. A stand-up desk and an exercise bike in the office. An extra hour off every week for exercise. Annual counselling session (with R U OK? Day). Enter a work team into a fun run or other fitness event and then build group training sessions into your lunch break.